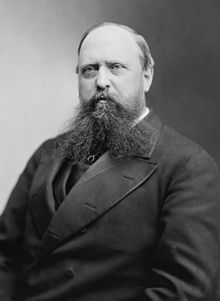 Othniel Charles Marsh (October 29, 1831 – March 18, 1899), U.S. zoologist and palaeontologist. Marsh, O.C. 1879. Notice of new Jurassic reptiles. American Journal of Science and Arts 18: 501–505. Marsh, O.C. 1889. Notice of new American Dinosauria. The American Journal of Science and Arts, series 3 38: 331–336. Marsh, O.C. 1890. Description of new dinosaurian reptiles. The American Journal of Science, series 3 39: 81–86. Marsh, O.C. 1891. Notice of new vertebrate fossils. The American Journal of Science, series 3 42: 265–269. Marsh, O.C. 1894. The typical Ornithopoda of the American Jurassic. American Journal of Science, series 3 48: 85–90. Marsh, O.C. 1898. New species of Ceratopsia. American Journal of Science 4:92. This page was last edited on 28 February 2019, at 17:16.